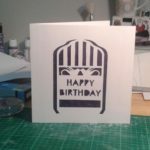 One of my friends just had a birthday, I thought I’d create a cut-out card. 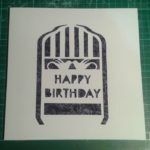 The image is bird cage with two birds and happy birthday within it. I backed the cut-out section with purple fabric.